New research report “Wireless Sensor Networks Market to 2016 - Energy Harvesting Techniques to Create New Opportunities” developed by GBI Research has been recently published by Market Publishers Ltd. According to the report, bluetooth low energy, ZigBee green power, Wi-Fi direct and EnOcean technologies will drive growth into such areas as medical devices, healthcare, automotives, energy efficient buildings, sports and agriculture. Wireless sensor network (WSN) is a wireless network consisting of spatially distributed autonomous devices using sensors to cooperatively monitor physical or environmental conditions, such as temperature, sound, vibration, pressure, motion or pollutants, at different locations. The development of new technologies is moving WSN into new areas of application. Bluetooth low energy, ZigBee green power, Wi-Fi direct and EnOcean technologies will drive growth into such areas as medical devices, healthcare, automotives, energy efficient buildings, sports and agriculture. New research report “Wireless Sensor Networks Market to 2016 - Energy Harvesting Techniques to Create New Opportunities” developed by GBI Research has been recently published by Market Publishers Ltd. 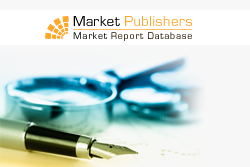 The research report provides in-depth analysis of the market opportunities in the global wireless sensor networks industry. Companies mentioned in the report include: SmartLabs Inc., Zensys, Freescale, Texas Instruments, Ember, CSR, Qualcomm Atheros, Dust Networks, and MicroStrain Inc.
More new studies by the publisher can be found at GBI Research page.